Wonderful Wednesday – Happy National Mortgage Broker Day! #WonderfulWednesday – I ♥ serving mortgage brokers! Happy National Mortgage Broker Day! – For almost a decade now I’ve been serving mortgage brokers to help them close more loans, and the relationships I’ve developed are #Priceless! It’s great to help a broker increase business and help them close more loans with options. In fact, I have 9 different Non-QM loan options and can serve FHA/VA loans down to 550 FICO now. Let’s connect and work together to help you close more loans, CLICK HERE! Join Us In Creating Yes’s for your Pipeline all week I’ve been highlighting companies and tools that help mortgage brokers grow their business. Today’s video and blog is filled with three different ones. While they serve the same function, each one is slightly different in what they do and I see they compliment each other more than anything. Lead Pops – A great templated landing page with some customization that allows you to gain leads. 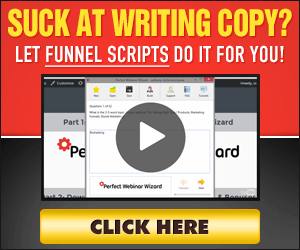 ClickFunnels – The most advanced landing page builder with ton’s of functions. You can embed just about anything and my advice is that your also the creative type. Phonesites – The newest of the three and designed to be for those not tech savvy but want ease of use and simple to create custom landing pages. #ThursdaysThoughts – Get Landing pages to help you advertise your products, grow your referral partners, get people signed up for events or just say you have the lowest rates! Any way you slice and dice it you need to accelerate now, don’t let your foot off the gas! I see a lot of LO’s that get busy and then “stop” or slow down with their advertising or expansion of referral partners. When your busy that’s the best time to network. Not when your slow. Get Landing pages to help you develop these types of campaigns in under 5 minutes. Like ZERO tech skills are needed. And is half the price of what click funnels and some of the other platforms that help you, but cheaper, easier and quicker to take action with! It’s Phonesites! And it’s 47 dollars a month. That’s it! Don’t let off the gas, get on point! The point is now, the point is a must to create multiple lead magnets that create you interested prospects based on your ad copy! I can show you how to implement all of this. Inside our exclusive LO group for those taking action many are using various types of organic and paid campaigns to gain leads. We provide YOU the opportunity to #Copy #Paste #Post #Profit from the ideas we provide. Feel free to join here —> Mortgage Marketing Syndicates!